rock outcrops and lush Mediterranean vegetation, it is an excellent choice for cultural tourism, while also close to the sea and to the lively the Costa Smeralda. 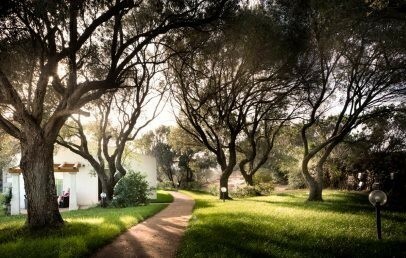 Surrounded by 180 hectares of wild nature, the Tenuta Pilastru Agritourism is located in “Gallura”, 5 km away from Arzachena. The fascinating Gallura area embraces the north-east coast of Sardinia. The nearest beach (12 km) is in Cannigione while the nearest airport is Olbia-Costa Smerada (35 km). 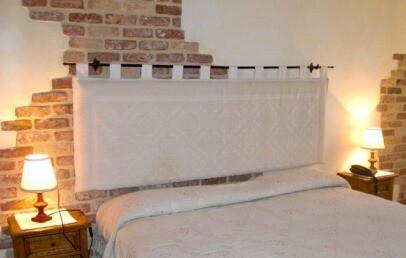 Tenuta Pilastru was a typical farmhouse successfully restored to become a charming and comfortable agritourism. It consists of different buildings, called also “stazzi”. 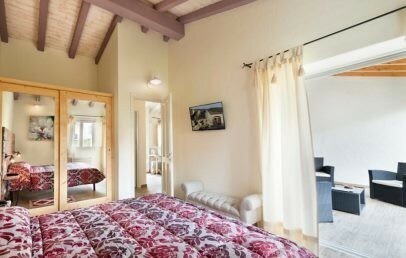 The main one is “Lu Pastrucciali” which hosts the reception, a lounge area, a fireplace and some bed rooms. In other smaller buildings you can find both rooms, the spa and the restaurant. At guest disposal are also the swimming pool and solarium, placed in the garden. 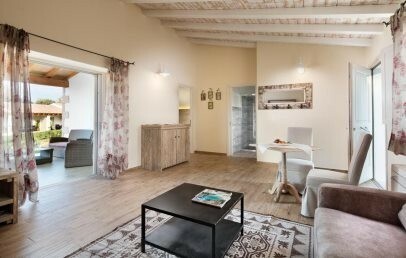 Tenuta Pilastru has 40 rooms spread throughout the surrounding property. 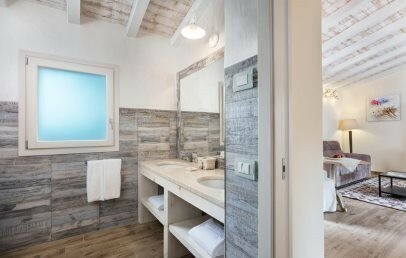 All rooms are characterized by a country style or country chic style with natural materials such as terracotta, wood and cotton. They are fully equipped with air conditioning, satellite TV, frigo bar, hair dryer, shower, courtesy set. The view from the rooms are on the garden, countryside or hills. The Wellness Centre of Tenuta Pilastru offers different esthetic treatments and you can relax in the finnish sauna, Turkish bath with cromo therapy, frigidarium, sensorial showers, whirlpool and swimming pool. An area is dedicated to fitness and equipped with Technogym machines. Rates per person, max 2 hours: Access to Aqua Path € 30; Acces to the fitness area € 15 (subject to change, to be paid on-site). The beauty and wellness treatments are to book and pay on-site. The Restaurant is located in a separated building and characterized by typical granite rocks. The menu is based on Gallura culinary tradition and prepared with fresh ingredients such as locally produced meats, pasta, and wine. The restaurants can hosts until 130 seats and is opens to external guest too. For lunch the restaurant is open only on Sunday (summer months excluded) and offers typical Sardinian menu. The guest of the hotel can choose between a typical Sardinian menu or a à la carte menu. External guests can only enjoy of the Sardinian menu. 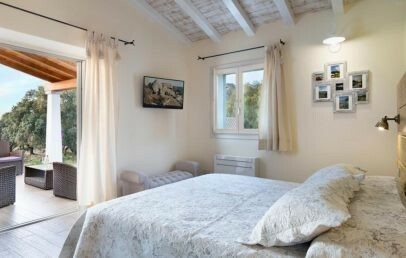 The Tenuta Pilastru organizes for its guest horseback riding, bicycling, trekking, boat tours to the minor islands, visits to our cow farm and cooking classes. The conference centre is perfect not only for work meetings, but also for conferences, workshops, art exhibitions and ceremonies and you can also reserve buffet service and coffee breaks. The services are fully guaranteed from March 1st until November 2nd. During the rest of the year, some services may not be fully available. Small pets are allowed on request. Cost: € 8,00 total for stays of less than 3 nights, € 15,00 for stays of up to one week and € 20.00 for stays longer than one week. Comfortable double rooms located in the different buildings spread throughout the surrounding property and not further away as approx. 80 m from the main building. 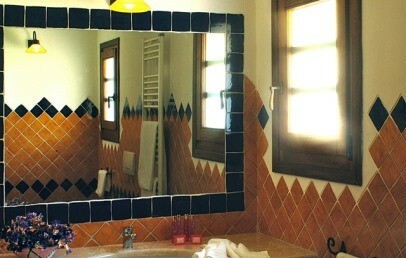 They are characterized by typical Gallura style and furnished with terracotta, wood and cotton materials. All rooms are fully equipped with air conditioning, satellite TV, minibar. The bathroom has hair dryer, shower, courtesy set. The Standard rooms have view over the hills or garden or countryside. Spacious Suite located in a more quiet area of the property with garden view. 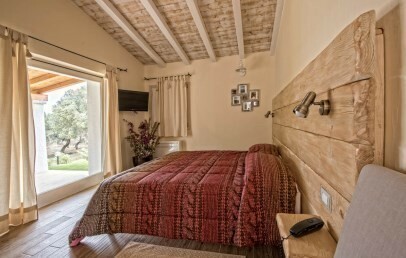 They are characterized by a Country Chic style furnished with lots of wood and natural fabrics. The Suite have a comfortable living room and are equipped with air conditioning, satellite TV, minibar, kettle. The bathroom has shower, hair dryer, bathrobes, slippers, courtesy set. The Suite have a covered private veranda equipped with a lounge table and easy chairs. Comfortable double rooms located in a more quiet area of the property with garden view. 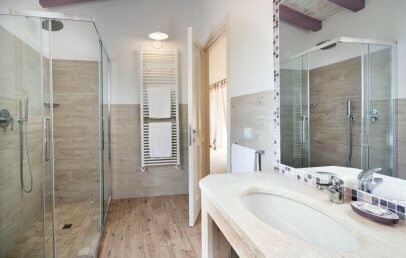 They are characterized by a Country Chic style furnished with lots of wood and natural fabrics. All rooms are equipped with air conditioning, satellite TV, minibar, kettle. The bathroom has shower, hair dryer, slippers, courtesy set. The Superior rooms have a covered private veranda equipped with a lounge table and easy chairs.